A founding member of Sullivan Hill, member of its Executive Committee and chair of the Insolvency and Commercial Bankruptcy practice group, Jim Hill practices primarily in the areas of bankruptcy, insolvency and commercial law. His bankruptcy experience includes representation of creditors, bankruptcy trustees and select bankruptcy debtors in Chapter 11 business reorganization cases, and he has served as a court-appointed examiner and mediator. Mr. Hill also works regularly with clients on asset sales and acquisitions, on state and federal court receivership cases, and on business workouts, restructuring and dissolution matters, among other commercial law matters. Mr. Hill is the inaugural Chair of the Board of Representatives of the California Lawyers Association (CLA), representing nearly 100,000 current California attorneys and other members of its various Sections. He is the current CLA Board Representative of the Business Law Section (BLS), of which he was the chair in 2016-2017 when it was still part of the State Bar of California. Prior to that, Mr. Hill was co-chair of the BLS Insolvency Law Committee (2012-2013). 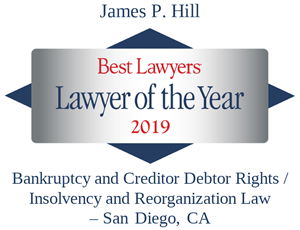 Mr. Hill was recognized in Best Lawyers® as the “Lawyer of the Year” in San Diego in 2019 and in 2017 in the fields of Bankruptcy and Creditor Debtor Rights/Insolvency and Reorganization Law, and was selected by his peers for inclusion in the 25th, 24th and 23rd Edition of The Best Lawyers in America® in the fields of Bankruptcy and Creditor Debtor Rights/Insolvency and Reorganization Law. In addition, Mr. Hill was named a Top Rated Lawyer by Martindale-Hubbell and American Lawyer Media in Commercial Bankruptcy and Creditor-Debtor Rights and in Corporate Restructuring and Bankruptcy. Mr. Hill enjoys an AV® Preeminent™ Peer Review Rating by Martindale-Hubbell. Mr. Hill has also been recognized as a Super Lawyer in the field of Bankruptcy and Creditor/Debtor Rights in 2007-2019 and was named a Top San Diego Lawyer in 2015-2019 by San Diego Magazine. He was selected as one of The Daily Transcript’s “50 Influential Leaders” in the San Diego business community for 2018. He was also named Mediator of the Year by the Bankruptcy Court for the Southern District of California in 2013 and again in 2014-2015. Previously, Mr. Hill was named on the San Diego Business Journal’s Best of The Bar list for 2016. In re Dow Corning Corporation. In re Western Pacific Airlines. In re Imperial Corporation of America. In re Nucorp Energy Corporation. In re Frontier Properties, Inc. In re Boileau & Johnson. In re Southern California Sound Systems. In re Amtel Communications, Inc. (ACI-HDT). In re United Airlines, Inc. In re Commercial Money Centers. In re Global Management Systems. In re Varig, S.A. (Ch. 15 NY and Brazil) (Aircraft Lessor). In re Chemtura/Great Lakes (NY) (Truck Lessor). In re Blockbuster, Inc. (NY) (Landlord Client). In re Haggen Holdings, LLC (DE) (Landlord Client). In re Sotera Wireless (Official Committee of Unsecured Creditors). In re Pacific Imperial Railroad (Landlord Client). In re Nite Lite Inns. In re Grivas/Southwest General Industries. In re Villas at Alta Murrietta. In re Income Growth Partners Ltd. X. In re Daniel X. Wray/Biofilm, Inc. In re Alex Abatti Jr./Abatti Farms et al. In re Carbite, Inc. (Carbite Golf). In re Herb Farm/HF Liquidation, Inc. In re William Wagner/Wagner Aeronautical. In re Comair Rotron Receivership (CA). In re Sullivan International Group, Inc. In re ABA Recovery Service, Inc. In re Thomas Tighe/Tighe Mercantile Inc. In re Lochmiller Industries, Inc. In re American Manufacturing Technologies, Inc. In re Grand Airways, Inc. (NV). In re Ambergris Caye Ltd. (NV). In re Tri-National Development Corp. (CA and Mexico). In re Tower Homes, LLC (NV). In re NADN (National Audit Defense Network) (NV). In re Consolidated Resorts, Inc. (NV). In re Asset Resolution, LLC (NV). In re Interstate Plumbing Corporation (NV). In re Dipak Desai (NV). In re Dr. Kevin Barkal / San Diego Pain Management Clinic. In re American Pacific Management Corporation (NV). In re Enrique Brunet v. Marcella Brunet. In re Mary Smith v. George Smith. In re Interstate Plumbing & Air Conditioning, LLC (NV). In re American West Development, Inc. (NV). Mr. Hill is a fellow of the American Bar Foundation and has been a longtime member of the American Bar Association’s Subcommittee on Business Bankruptcy. He is an active member and supporter of the San Diego County Bar Association, having served as a director of the San Diego County Bar Foundation from 2008–2011. He is also active in the SDCBA’s Bankruptcy Law Section, and formerly served as chair of the SDCBA’s Commercial Law Section for two successive terms (1985–1987). 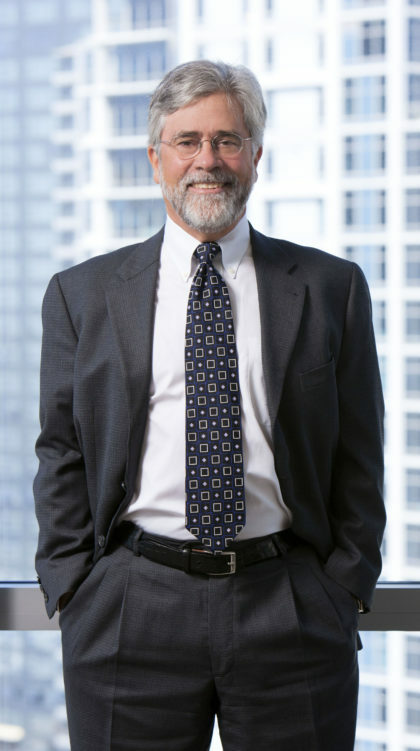 He also served in various officer positions with the San Diego County Chapter of the Federal Bar Association and is a member of both the American Bankruptcy Institute and the National Association of Bankruptcy Trustees. He is a member of the California Bankruptcy Forum and the San Diego Bankruptcy Forum (having served on its board of directors from 1991 to 1994) as well as of the San Diego and California Receivers Forums. Additionally, Mr. Hill is an instrument-rated private pilot and serves as president of the San Diego Flight Corp. (dba San Diego Flying Club), San Diego’s longest operating member owned not-for-profit flying club. Mr. Hill was admitted to the State Bar of Texas in 1978 and to the State Bar of California in 1979. He is admitted to practice before all courts of the State of California, before the United States Supreme Court and the United States Court of Appeals for the Ninth Circuit and before the United States District and Bankruptcy Courts for the Southern, Central and Northern Districts of California. Mr. Hill served as Law Clerk to the Hon. Walter Ely on the United States Court of Appeals for the Ninth Circuit in 1978–1979 before entering private practice. While at the University of Texas, he was a member of several academic honor societies, including Phi Kappa Phi, Kappa Tau Alpha and the Order of the Coif.